90 Items. Showing Items 49 thru 72. Well, not ONLY 15 horses... We just couldn't resist adding five friends for company: a goat, a rooster, a goose, a dog, and a cat. The pictured quilt is 33" x 57". Sixteen horses! A quilt to melt any young girl's heart. The techniques used are satin stitching and raw edge applique. Fourteen koalas, tree branches, with 3-D leaves. 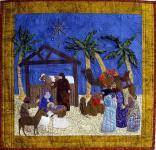 The quilt in the photo measures 32" x 41"
This pattern is great for beginners. There are only five ladybugs so the pattern is do-able in a short amount of time. The quilt measures 10 1/2" x 37". Ladybugs are revered as lucky in many cultures. Four lizards are featured in this pattern: iguana, gecko, monitor, and a chameleon. There are 18 full sized drawings of llamas and alpacas, with instructions for raw edge appliqué, machine quilting, binding the quilt, and signing your name freehand on the sewing machine. You can arrange the critters any way you like, such as in a single scene or rearrange the blocks. 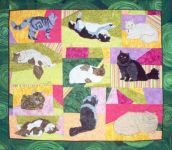 Ten fluffy felines for raw edge applique on crazy quilt blocks. Four playful monkeys hanging out on the branches! Of course, a banana comes with this pattern too! 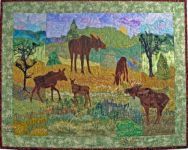 The Moose quilt backgrounds are stitched in raw edge applique technique (straight stitch with a darning foot), and all the moose are satin stitched. This is a small appliqué pattern with lots of details and embellishment for a special time of the year. The quilt in the photo measures 37" square. There are drawings for machine applique for 50 animals and two sizes for the Ark, in case you want to embellish clothing, for which you'd need a smaller version. A finished quilt made from this pattern is available to purchase. Email us at info@critterpat.com for details. This beginner pattern will teach you how to felt an applique, blend colors and make little wall hanging for your beach house. Otters are such playful animals. It seems they have no cares at all. 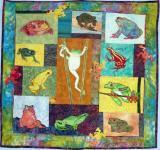 That is what makes them a charming subject for an applique pattern. 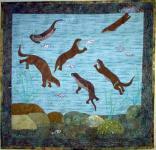 There are six otters and a fish in this pattern featuring raw edge applique technique, some easy hand embroidery and beading. Our Cats a mixture of machine appliqué techniques and varieties of domestic shorthair cats who live in and around our building and within our family. There are twelve cat drawings and 10 feather drawings included in the pattern for quilting designs or extra appliques. There are nine owls and three baby owls in this pattern with four leaves for 3-D applique and also used for quilting patterns. 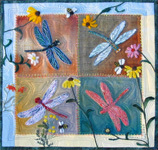 The feather details can be traced and stitched as quilting once the quilt top is complete. This pattern features 6 pandas, bamboo, and 3-D leaves. This would make a good beginner pattern because there are not a lot of sharp edges (pandas have rounded body parts). Nineteen Penguins in seven varieties all in one pattern. They are walking, talking and swimming, with five snowflakes. A family of nine pigs with 3-D ears & curling tails, and a spider and her web with sewing machine embellishments. This pattern is for quilters who don't have anymore wall space for hanging their work. Now you can wear your quilt designs! 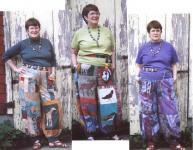 Debora has been developing these pants for the last ten years and finally decided to share them with other quilters. Twenty four rabbit drawings with cabbages, carrots, a spider and grasshopper, praying mantis, butterflies and a bee with instructions for machine embroidered clover. A finished quilt made from this pattern is available to purchase. Email us at info@critterpat.com for more details. Lion, antelope, camel, a monkey, a baboon, heron, crocodile, 2 ostriches, meercat, egret, 2 zebras, 2 elephants, and a chimpanzee are among the 26 creatures in all! This is a quilt top (not quilted) and it measures 46" x 56". The lion is 12" long and 6.5" high. Six seashells and a kelp make up this design for a small quilt measures 28" x 28". Yours could be a different size if you arrange things differently. 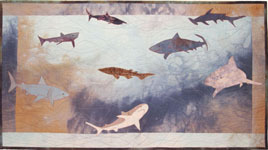 There are nine drawings of sharks, eight of them made it onto this quilt. The other one is a bonus shark which is breaching out of the water like a whale, and his teeth are showing.